A bill seeking to protect whistleblowers from persecution has passed first reading in the House of Representatives. The bill, which is in recognition of Article 33 of the United Nations Convention Against Corruption encourages state parties, seeks to develop legal frameworks for whistle-blowing and the protection of whistleblowers. The Senate had earlier passed the Whistleblower bill. The chairman, House of Representatives Committee on Financial Crimes, Kayode Oladele, who presented the bill said if passed into law, it would protect whistleblowers from all forms of attack and reprisal. 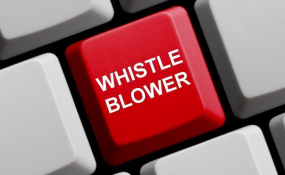 The law, if enacted will among other things, encourage and facilitate whistle-blowing, regulate the receiving of petitions, investigating and otherwise dealing with disclosures by whistle blowers. According to the sponsor of the bill, it further provides for protection for making disclosure of impropriety leveled against public office holders. Earlier, the bill was a product of 2-day stakeholders' seminar to engage the legislative process of enacting a whistleblower protection law for the country organized by House of Representatives Committee on Financial Crimes in collaboration with HEDA Resource Centre and Premium Times Centre for Investigative Journalism with the technical support of PLAAF. The Seminar was attended by the Speaker of House of Representatives, representatives of Open Government Partnership Secretariat, Office of the Attorney General of the Federation; Director General, National Orientation Agency; representative of United Nations Office on Drugs and Crimes; representative of the Acting Chairman of EFCC; media practitioners, labour leaders, civil society leaders; NUJ President; and acting President of National Youth Council.